Day 3: The drizzling rain softly woke us from our slumber. Last night was a festive and insightful night at the Yamanaka Lake Seminar House. Not only did the USC students bond with the Meiji students through various activities such as Japanese calligraphy (shodou) and karaoke, but the past few days allowed for much cultural exchange, as we all stayed together in a Japanese-style retreat at the base of Mt. Fuji. While the night was fun, the lack of a curfew ended up hindering many students from eating their breakfast. When I arrived at the cafeteria around eight or so, only a couple of students were there, which meant I could allow myself to devour more food. After eating, we all returned to our rooms to pack up our things. Even though the director of the Yamanaka Lake trip, Tom Power, had asked the students to simply fold the futons, my Meiji roommates also wiped off the table and sink in our room to restore it to the original condition in which we found it. After breakfast and packing up, the Meiji and USC students joined together for a discussion session. The session involved topics such as improving cultural exchange and the differences between Japan and the U.S. The Professor divided us into groups, and our group discussed how much more efficient and conservative Japan is compared to other countries such as the U.S. One thing that really shocked me after coming to Japan is the way people always finish their food; they leave nothing behind on their plates. 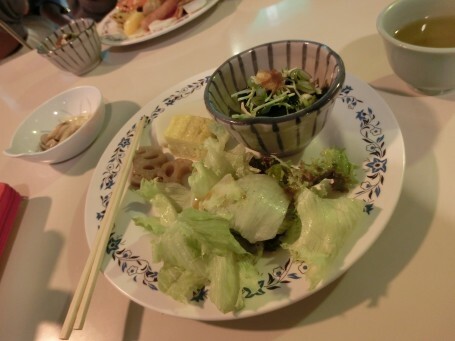 In the U.S., I’m used to taking my unfinished meals to go, but Japan does not really offer such a service, and so everyone usually finishes all of the food they ordered at that one sitting at the restaurant. Furthermore, navigating the intricate subway system not only provides a great opportunity to exercise, but it is also inexpensive and very efficient. Our group also discussed how people should step out of their comfort zone to allow for greater cultural exchange. 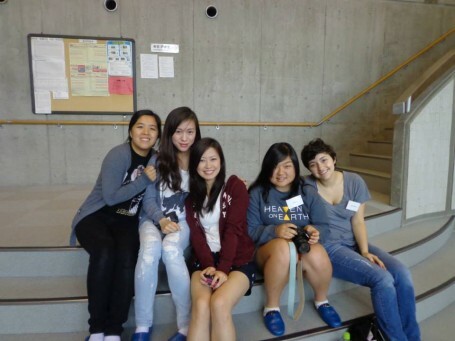 The discussion also broke down common stereotypes held between the USC and Meiji students. For example, we found out the Japanese do not eat sushi or sashimi every day, and they discovered that Americans do not eat hamburgers every day, either. Breakfast on our second day at Yamanaka Lake Seminar House! 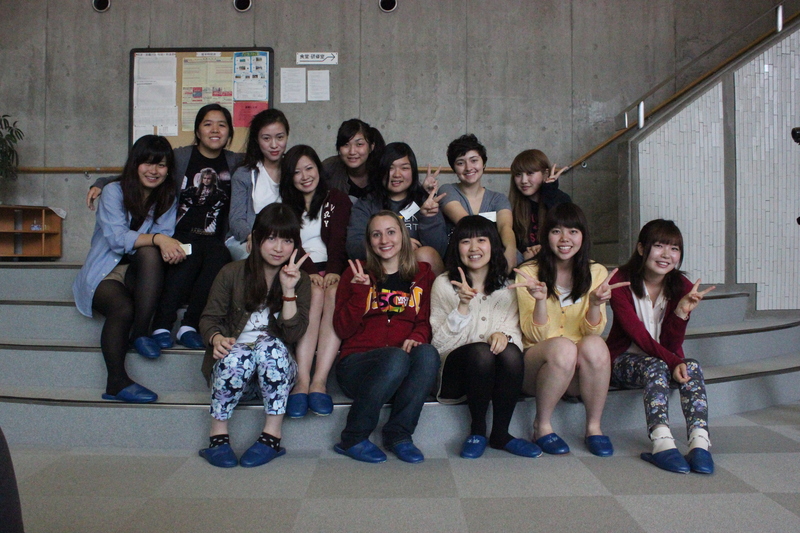 Before departure, our instructors took many photographs as if we were magazine models. We tried various poses and locations, but the instructors were not alone in wanting to preserve such precious memories; I also hoped to obtain an eternal memory of this wonderful experience. A small group photo with the Meiji supporters’ leader, Risa! 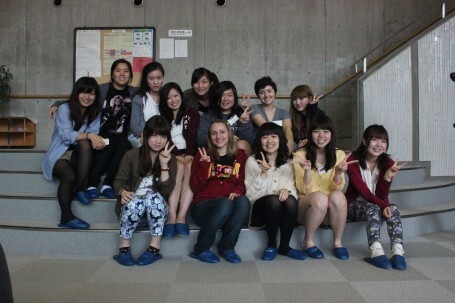 Another group photo with the Meiji girls. As we boarded the bus, some students were disappointed because we had not yet caught a glimpse of the top of Mt. Fuji. But we took a risk as we drove up through the clouds in hopes of seeing this amazing (likely) future UNESCO World Heritage site. During the bus ride, a Meiji supporter named Yuki and I somehow stumbled upon the topic of genetic engineering. She described how she is scared that Japan may soon stop labeling genetically engineered foods, which reminded me of how the recent proposition to start labeling genetically engineered food in California did not pass. Perhaps economic interests are universal; they encounter no cultural barriers since both the U.S. and Japan hope to market genetically engineered foods to the public. 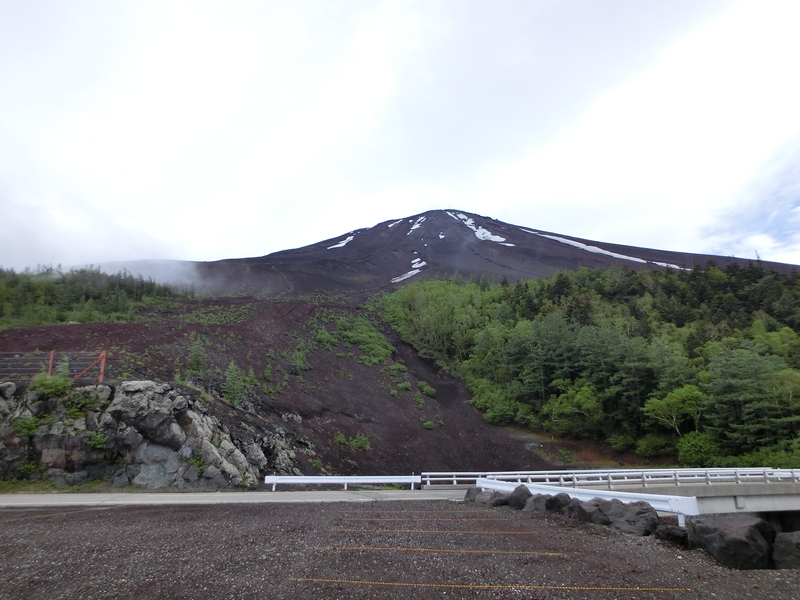 When the bus finally arrived at the half-way point to the top of Mount Fuji, we found ourselves encased in fog. I never imagined such chilly weather in Japan’s summertime. While many students were hungry and searched for restaurants, the cutely packaged, edible souvenirs visible inside the gift shops distracted me. The shops sold various Mt. Fuji- shaped snacks. I found them very interesting because such designs and advertisements are very rare in the U.S. Sometimes I wish the U.S. also had such packaging because I’m sure even American girls would not be able to resist such kawaii sweets. I spent most of my time shopping for edible souvenirs together with a few other students, and thus we ended up not having adequate time for a proper meal. Instead, we went to buy an exclusive Mt. Fuji meron-pan (melon bread)! Although the mountain-shaped bread was difficult to eat, it was delicious. After our satisfying lunch it was time to once again board the bus. 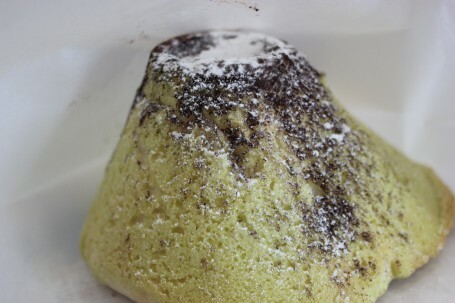 The Mount Fuji melon bread has a crunchy texture at the base; the cacao powder on top balances the sweetness of the bread. 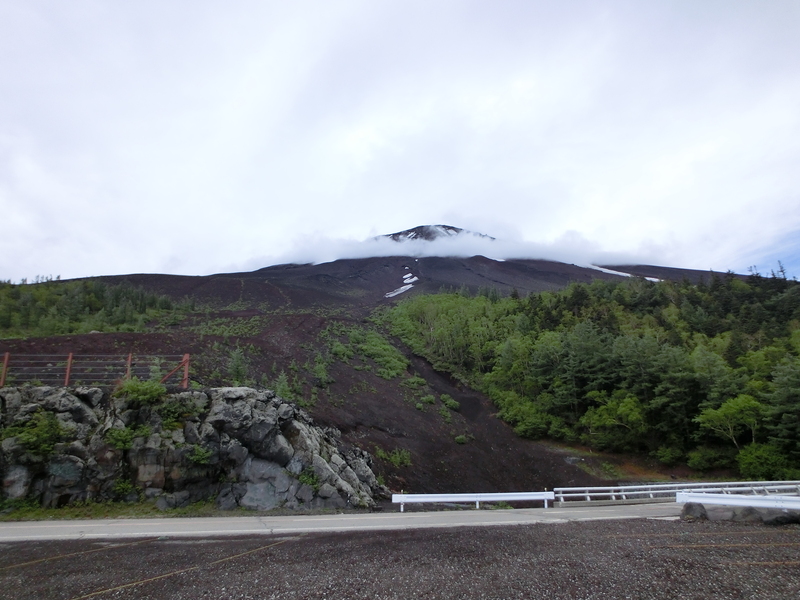 In the end, our trip to Mount Fuji did not end in vain. Miraculously, the fog cleared and Mount Fuji appeared just outside our window. Cameras in hand, we continuously pressed the shutter buttons and jubilantly hopped off the bus with our many gadgets ready; even the Japanese students were excited. Mount Fuji did not necessarily fit my stereotypical image of a huge, blue mountain. Instead, it had a reddish hue that I thought made it look powerful yet graceful. After all, it is an active volcano. Mount Fuji decorated with a ring of mist. A clear view of Mount Fuji. Even though I have been to Hakone before, the close-up view of Mt. Fuji was magnificent. We performed one of our signature group-jumps along with some regular poses to celebrate this auspicious moment. Our trip thus ended on a happy note. After seeing Mt. Fuji I felt a sense of relief, and dozed all the way back to Meiji University, but I will definitely miss the opportunity to bond with the Meiji students like this again.